To make the matcha syrup: combine a cup of water, a cup of white sugar, and 2 tablespoons of matcha green tea powder in a sauce pan over low heat. Whisk everything together until the sugar is melted and the matcha is dissolved. Bottle and refrigerate. To make the mocktail: combine the syrup and lime juice in a highball glass. 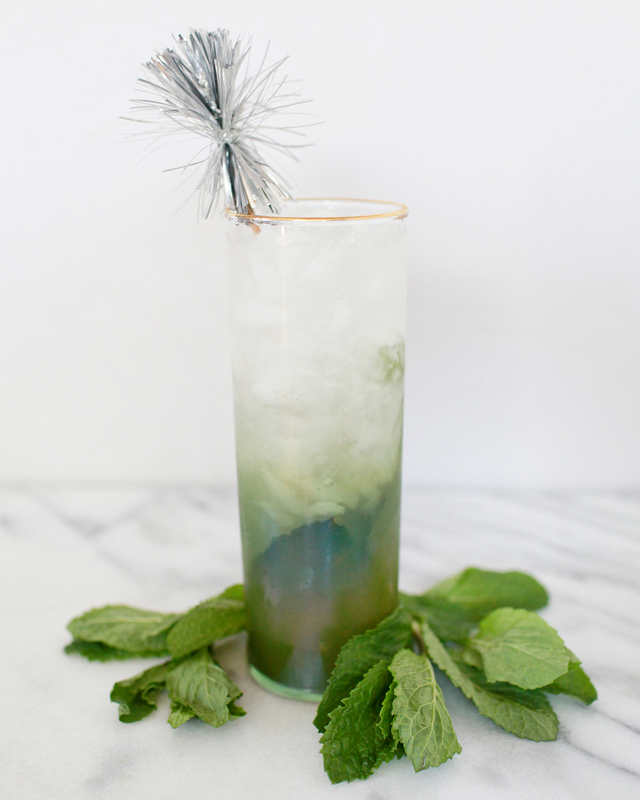 Add the leaves of a sprig of mint and gently muddle. Then fill the glass with ice, top with tonic water, and give a good stir. Enjoy! Matcha – a powder made from carefully selected and dried green tea leaves – is a fun thing to add to mocktails and cocktails alike. It’s the same ingredient that goes into Japanese green tea, of tea ceremony fame. Matcha adds earthy botanical notes and a bit of tannic astringency – something that you might get from some spirits but that can be hard to replicate in a mocktail. A syrup made from matcha is also a deep, rich green color, which can make your drinks sparkle green. Mint and lime are, it goes without saying, amazing and delicious together. Add in the matcha syrup and you have the foundation of a pretty good mocktail – sweet and tart and minty and earthy and richly green. To that we add tonic water, and we can’t emphasize enough: real tonic water, made with actual quinine, is the only way to go for mocktails. (I mean, it’s important in cocktails too, but it’s a lot harder to fake flavors in a mocktail, since mocktails don’t benefit from the powerhouse flavors of booze.) Tonic water adds refreshing effervescence (and this is a really refreshing drink) and some of the bitterness that can be missing from mocktails. Bitter is one of the ways our brains recognize things that are really dangerous (like poison!) or really fun (like coffee!) or a little bit of both (like alcohol!). It helps elevate this drink into a legitimately complex and grownup mocktail.